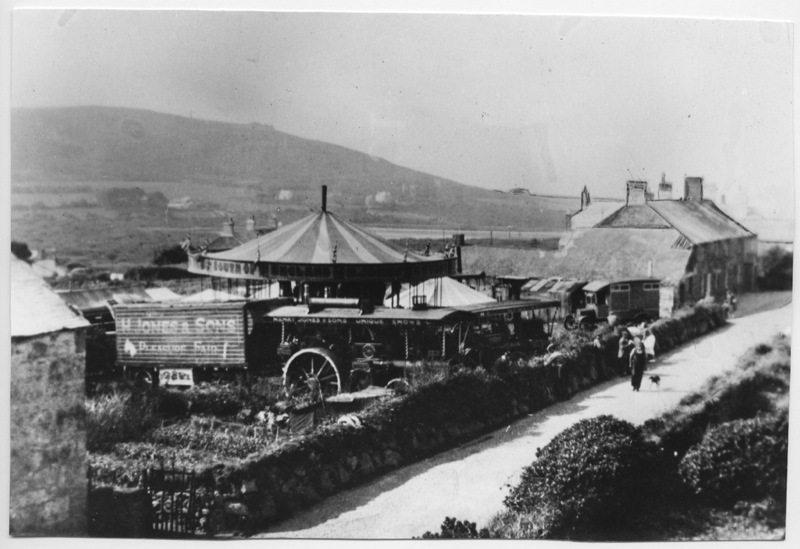 Few people now can recall the annual visit of Henry Jones & Sons Fair to Halsetown where they built up in a crowded meadow among the cabbages and rows of peas, some 700 feet above St Ives and in the shadow of Rosewall (locally called Buttermilk) Hill. Three engines are seen here mingling with the vegetables, and in the background what appears to be an ancient Ford or Morris Commercial living van. Henry and his family came to Halsetown from the late 19th century until the 1930s, when this photo is thought to have been taken. “Henry Jones & Son Pleasure Fair in Cabbage Patch ,” Morrab Library Photographic Archive, accessed April 21, 2019, http://photoarchive.morrablibrary.org.uk/items/show/13768.